For any Nintendo fan, November 22 is going to be one of the best days of the year. On Friday, three new games in three extraordinary franchises are launching on the Wii U and Nintendo 3DS systems. Super Mario 3D World for Wii U, The Legend of Zelda: A Link Between Worlds for the Nintendo 3DS family of systems and Mario Party: Island Tour, also for the Nintendo 3DS family of systems, are all launching in stores and in the Nintendo eShop. The games feature Nintendo characters and experiences that can’t be played anywhere else, and demonstrate how Nintendo is bringing value and variety to everyone for the holidays. Super Mario 3D World is the newest game in the world-famous Super Mario Bros. series. The Wii U game is the first 3D Mario platformer that lets up to four players play together using Mario, Luigi, Princess Peach and Toad. Each playable character has different abilities. For example, Luigi can jump higher than the other characters and Princess Peach can float in the air for a limited time. Super Mario 3D World introduces players to beautiful HD graphics, numerous breathtaking worlds and never-before-seen power-ups like the cat transformation. In multiplayer mode, one player is able to play using the Wii U GamePad while up to three others can use various controllers like the Wii Remote or the Wii U Pro Controller. The Legend of Zelda: A Link Between Worlds is the successor to fan-favourite Super NES game The Legend of Zelda: A Link to the Past, which launched in 1992. Even though The Legend of Zelda: A Link Between Worlds takes place in the same world as its classic predecessor, it is a new adventure, filled with a new storyline and new dungeons. In this Nintendo 3DS game, Link must journey between two worlds, Hyrule and Lorule, using a mysterious power that lets him become a drawing on walls. Link’s ability to merge with walls allows players to solve puzzles and explore dungeons in a new way. Players are also able to buy or rent various items throughout the game, allowing them to explore dungeons in any order they want, adding a new level of freedom to the game play. A legendary Nintendo 3DS XL bundle will also launch on Nov. 22. The bundle includes gorgeous gold-and-black Nintendo 3DS XL hardware with the iconic Triforce on the exterior, as well as a download code for The Legend of Zelda: A Link Between Worlds at a suggested retail price of $219.99. The system is gold-coloured on one side and black on the other, beautifully representing the two parallel worlds Link travels between in the game. 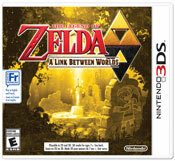 For more information and a list of retailers, visit The Legend of Zelda for 3DS web page. 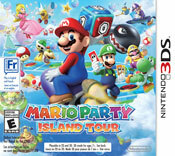 With Mario Party: Island Tour, players can take the party on the go! The game is the next installment in the wildly fun Mario Party series, and the first on Nintendo 3DS. Mario Party: Island Tour features mini-games with more unique play styles than any other game in the Mario Party series. Players will imitate voices of some of the most iconic characters from the Super Mario Bros. universe using the built-in microphone on the Nintendo 3DS system, tilt the system to hang glide and even adjust reality with AR Card play. Mario Party: Island Tour also features Download Play, which means up to four Nintendo 3DS or Nintendo 2DS owners can play together when in the same room – even if only one person owns the game! This entry was posted on Tuesday, November 19th, 2013 at 9:23 am and is filed under Action Adventure, Everyone, Everyone 10+, Mobile, National News, Party, Peripherals, Platform, Upcoming Releases. You can follow any responses to this entry through the RSS 2.0 feed. You can leave a response, or trackback from your own site.